These ghosts can be a fun addition to any design! 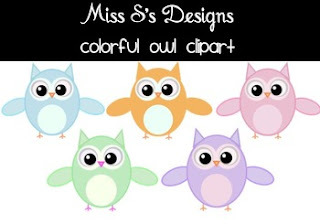 It comes with 5 different colored owls! Each design is a PNG file that has a transparent background. It comes in a ZIP file. All designs are copyright Miss S's Designs. You are granted permission to use these designs as long as you adhere to the following terms. Credit must be given by stating “graphics created by Miss S's Designs" in your product package.